We’d love your help. 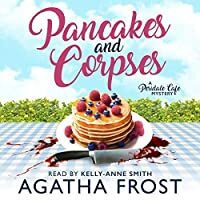 Let us know what’s wrong with this preview of Pancakes and Corpses by Agatha Frost. A Soon to be divorced Julia South never expected to be caught up in solving a murder, until she discovered the body of her cafe's most awkward customer. With a new smug Detective Inspector in town who underestimates her every move, Julia makes it her mission to discover the real murderer, before her village friends are dragged into the frame, and more bodies are discovered. To ask other readers questions about Pancakes and Corpses, please sign up. I DNFed this book last year and this is the second time I've read this cozy-mystery. Happy to say, I liked this book much better than the last time. The setting and the characters come across a bit cookie-cutter, nothing new nor novel about this book, but I liked it fast-paced and the way the suspect after suspect thrown onto the table. It had me piecing together the information and guessing who the murderer is. That this book is about solving a double homicide case is also interesting. Double h I DNFed this book last year and this is the second time I've read this cozy-mystery. That this book is about solving a double homicide case is also interesting. Double homicide in one book is not at all surprising in mystery novels, but I wasn't expecting this twist from this cozy-mystery, despite the fact it'd been more than 10 months since I DNFed this book, it took me by surprise which I think is good. The writing is solid and the pacing is just right. It reads really fast and there are lots of intrigues and clues that makes readers want to play detective and solve the case themselves (and I was one of them). That said though, I did have an issue with the plot, in particular, with how Julia figuring out the culprit. Not only the culprit reveal was devoid of suspense and tension, the clues hinted scattered in the story were not decisive or apparent enough to nail down the culprit as far as I'm concerned. I think fans of Mystery or cozy-mystery generally like the 'whodunit' element and I'm afraid this book fails to entertain the readers in that regard. It was not until I heard Julia's explanations as to how she narrowed down the suspect that I got to piece everything together. Granted, some of the clues were certainly hinted in the book. Yet I also have to mention some were not revealed until the case was solved. This might be a standard technique in mystery books, but as a novice of mystery books, it was a bit of a letdown that I didn't get to pin the culprit by myself. Look at that cover... it caught my eye and drew me in (plus it made me want those pancakes). The summary sounded like fun so I went for it. Great concept but sub-par execution for me. All the ingredients were there but the final product lacked that "spark and charm" I was expecting. More telling than showing, I felt like things were being thrown at me but nothing was sticking. Also like I was on a rushed guided tour in some ways. The final confrontation with the killer had me bored and almost rolling my eyes as well. Also, felt no chemistry between Julia and a certain other person. Again, more telling than showing. First novel in a series sets everything up yes, but a feel for the atmosphere and people is still expected and for me, none of that happened. The extra points were for Julia's food at the cafe.. it all sounded delicious! A very nice mystery with just the right little amount of romance to spice things up a bit. An investigation that develops very good over the course of the book and a surprise perp. I am not really not too much of a fan of a main character that only investigates because they want to prove that they are smarter than the police. Other than that a very nice start to a new series. Literal delicious perfection! Exactly what my soul needed at this moment! These cozy murder series books are funny, devilishly schematic and good to read on a chill November evening with a glass of red wine. Two murders, a mother & son; who could have done it? A new Detective on the scene and he seems pretty capable but has just arrived and doesn’t appear to be too friendly. It’s mayhem in a small town and the cafe owner, Julia, will find the clues to announce who the killer is. Simple read, romantic innuendos, nosy neighbors, blackmail and murder. An enjoyable rea These cozy murder series books are funny, devilishly schematic and good to read on a chill November evening with a glass of red wine. Kindle Unlimited, this was supposed to be a Brit character. not bloody likely. Also such things as asking questions, as a police office, for clarification of facts, is not 'twisting her words'. You are also not the only witness, when you really didn't witness much of anything. Does anyone need a fashion rundown on what clothing everyone is wearing. It's right up there with the almost incessant rambling nonsensical food talk. Nothing has much of anything to do with anything such as the murder. Wh Kindle Unlimited, this was supposed to be a Brit character. not bloody likely. Also such things as asking questions, as a police office, for clarification of facts, is not 'twisting her words'. You are also not the only witness, when you really didn't witness much of anything. Does anyone need a fashion rundown on what clothing everyone is wearing. It's right up there with the almost incessant rambling nonsensical food talk. Nothing has much of anything to do with anything such as the murder. What's worse, is it was boring, and even worse than that, read all 3 and they all have the same issues. After establishing himself in the M/M romance genre, Ashley John starts again with this cozy mystery - does it work? Absolutely. With his already clear skills with characters and situations, it's hardly surprising how entertaining this is. The killer is well concealed right up to the reveal - I certainly got it wrong. I cannot wait for the next one! Well done Ashley - yet another triumph. There was some mystery in there! loved it! 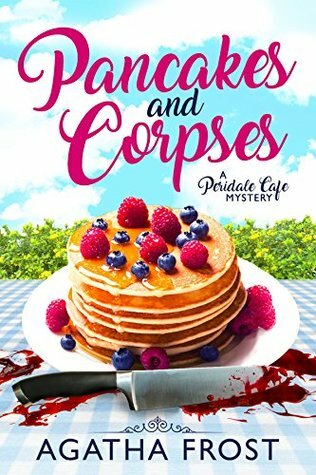 I love a good Mystery, and that is exactly what you get with Pancakes And Corpses. This book is about a bakery owner named Julia who tries figure out who the murderer is in the small village she lives in. This book keeps you hooked from he beginning. I highly recommend reading his book. I can't wait to see what happens in book 2. I am not a lover of the mystery genre. But when one of my favorite authors decides to dip his toes in the genre with a new series, I had to check it out. And I am so glad I did. It was the perfect small town murder mystery. I loved the small town atmosphere where everyone knows everyone, and everyone has flaws and secrets. It was a great location and led to a charmed feel throughout this story. The author threw so many little twists and turns at us, as for who the murderer was, that I had no clu I am not a lover of the mystery genre. But when one of my favorite authors decides to dip his toes in the genre with a new series, I had to check it out. And I am so glad I did. It was the perfect small town murder mystery. I loved the small town atmosphere where everyone knows everyone, and everyone has flaws and secrets. It was a great location and led to a charmed feel throughout this story. The author threw so many little twists and turns at us, as for who the murderer was, that I had no clue at all. I look forward to reading the next books in this series! I was given an advance copy of this book in exchange for an honest review. Cute & fun! My first cozy mystery ever & I see more in my reading future. The debut work of the new mystery author Agatha Frost (non M/M author) was a cozy and sweet read. This is a charming little mystery with enough distractions to not make the killer obvious. The romance is on the periphery of the story and never interferes and in Julia, the author has created a delightful character with enough unique characteristics and flaws to make her a perfect hook on which to sit the narrative. There's plenty of world building too, I have friends who live in Banbury so these little Cotswold villages are familiar to me and the author wonderfully evoked the feeling of small p This is a charming little mystery with enough distractions to not make the killer obvious. There's plenty of world building too, I have friends who live in Banbury so these little Cotswold villages are familiar to me and the author wonderfully evoked the feeling of small place life, where there's no such thing as a secret because everyone knows everyone else's business. As the new venture for an author I'm very fond of in their main M/M storytelling incarnation, this was a great debut. There were a couple of small typos but otherwise this is an engaging mystery, well told. *ETA: Apologies, I wrote the above while on my mobile with limited connectivity and so forgot to add this disclaimer. I used to be an avid mystery genre reader but drifted away when I discovered MM. When I was told one of my favourite MM authors had written this murder mystery I just had to read it. I was not disappointed. Julia is loveable and her tenacious attitude to finding the murderer is commendable. Add to the mix the village way of life (everyone knows everyone and everything) and you have a winning combination. oh and did I forget to mention the very attractive Detective... he'll get a few hearts racing. I I used to be an avid mystery genre reader but drifted away when I discovered MM. When I was told one of my favourite MM authors had written this murder mystery I just had to read it. A cozy murder mystery is definitely the perfect way to describe this book. While this book is not my usual genre, I was pleasantly surprised & really enjoyed this book. It was well written & kept me guessing till the very end. Julia reminded me of a younger Jessica Fletcher from Murder She Wrote. Looking forward to more of this series. 3.5 stars- It needs recipes! Julia South has returned to her small village in the Cotswolds after a her husband traded her in for a younger woman. Julia has always loved baking. It's her therapy. Since returning to Peridale she has accomplished her lifelong dream of opening a cafe. Serving up pancakes, mouth-watering cakes, coffee and tea, alongside village gossip, makes Julia happy. Everyone loves Julia and her cakes, except for one nasty reviewer and a new neighbor, Barker Brown. When Julia rea 3.5 stars- It needs recipes! Julia South has returned to her small village in the Cotswolds after a her husband traded her in for a younger woman. Julia has always loved baking. It's her therapy. Since returning to Peridale she has accomplished her lifelong dream of opening a cafe. Serving up pancakes, mouth-watering cakes, coffee and tea, alongside village gossip, makes Julia happy. Everyone loves Julia and her cakes, except for one nasty reviewer and a new neighbor, Barker Brown. When Julia realizes who wrote the scathing review of her cafe, she decides to confront the person. Before she can do so, Julia discovers the dead body of her nemesis! Barner Brown, Detective Inspector Barker Brown, is on the job. He seems to suspect Julia or even her best friend Roxy who was last seen sounding incoherent and distressed and is now nowhere to be found. Julia worries about her friend and fears DI Brown will miss the larger picture being a newcomer to the village. With her ear to the village gossip line and knowledge of all her neighbors, Julia sets out to solve the case. She also has to solve the case of the missing cakes. Each night someone breaks into her shop and eats her cakes! Who could it be? This is a charming little mystery. I never guessed who the murderer was or even the motive. The small village charm is OK but I don't like how gossipy everyone is. I didn't think most of the "scandals" were that shocking but I can see how one would be unprofessional. I also don't get chemistry between Julia and Barker. Their budding romance seems forced into the story. This book suffers from a lack of recipes that would bump my rating up higher. The characters are a little flat so far. Julia is appealing enough. I don't really understand why she drives an old car or dresses in 1940s clothing. She loves all things vintage, I take it? She doesn't have much personality. Just the words cheerful and sweet come to find. Gertrude Smith has no redeeming qualities- at least until all is revealed. She's the biggest gossip in the village and completely rude and mean to everyone, even Julia. It's Julia's business and she doesn't have to provide that woman with pancakes and fresh berries just for her. I would have banned her from my cafe if she was going to be so rude. Julia's sister Sue is cheery but lacks Julia's passion for baking and what Sue does in the end is shocking, not to mention probably illegal. Their Gran, Dot, is a feisty old lady and could be quite the character but she doesn't really get off the ground yet. Roxy Carter, Julia's school friend, has flamboyant red hair and is as passionate about teaching as Julia is about baking. She seems nice and a caring teacher. None of the other characters are really developed enough to love them. I can take or leave most of them. Roxy's sister Rachel is a gallery owner in Peridale and not as warm as Roxy. Their mother, Imogen, seems like an old-fashioned housewife who enjoys tea and gossip. Her secret was NOT shocking and to keep is a secret was wrong. Roxy's friend and assistant teacher Violet, doesn't seem to fit into village life yet. She's a devoted friend and I appreciate that. Gertrude's rival for the position of church organist, Amy Clark, is not really an agreeable character either. She has more redeeming qualities than Gertrude but I really don't like her. Her secret is pretty terrible. How can she hide in a small town? Gertrude's son, William, has a split personality or someone isn't telling the truth. He's one of two characters who show any development. I feel very sorry for him. Barker Brown is arrogant, rude and a bit snooty towards the small village he's chosen as his home. He softens as he stays in the village longer. Sue and her Aunt Dot live in Peridale. Julia manages to stumble onto a murder scene. pancakes with fresh fruit as a topping. Then a second murder occurs!!! the culprit in the act. reader part of the small town atmosphere. This is the debut mystery novel of Agatha Frost. Julia South returns to Peridale after her soon-to-be ex-husband kicks her out of their London home. She takes this opportunity to follow her dream and open her own cafe. She has always taken solace in baking and she was ready for a new start. After the murder of a not so well liked resident of Peridale, Julia decides she will be the one to solve this murder. A new Detective Inspector is in town and Julia does not appreciate his dismissive demeanor. This is the debut mystery novel of Agatha Frost. After the murder of a not so well liked resident of Peridale, Julia decides she will be the one to solve this murder. A new Detective Inspector is in town and Julia does not appreciate his dismissive demeanor. This just fuels her determination. She does not want any of her friends to be falsely accused. This story was fun and fast to read. Agatha Frost has written a terrific debut book. The MC Julia (the running thing with Barker and her name was funny!) get into all sorts of situations after finding the town's "mean old lady" murdered. The banter between Julia and Detective Inspector Barker Brown is sharp and well done. I also enjoyed the mystery and following along as Julia worked out who and why the murder(s) took place. This was a quick and intresting read. I really enjoyed the main character. This is a promising start of a new series. I found this book by coincidence. I was leaving a review for another cozy I just read add saw this one in the list of "also bought" books on amazon. The pretty cover caught my attention and I decide to give it a try. I am glad I decided to pick this one up, I had some small issues with it, but overall this was just a lot of fun to read and I am eager to continue the series. It fit the kind of read I was in the mood for. The book follows Julia who recentl This is a promising start of a new series. I found this book by coincidence. I was leaving a review for another cozy I just read add saw this one in the list of "also bought" books on amazon. The pretty cover caught my attention and I decide to give it a try. I am glad I decided to pick this one up, I had some small issues with it, but overall this was just a lot of fun to read and I am eager to continue the series. It fit the kind of read I was in the mood for. The book follows Julia who recently came back to her hometown and started her own café. I always like reading about characters who own their own business and even better if there's also food involved. The pace of this book was well done. The focus mostly was on the mystery and I would've liked to see a bit more about the café and the characters, but there were a few side plot lines besides the murder. I especially was invested in the side plot line about the thief who steals cakes. It was a nice twist when we figure out who is behind it. The mystery was pretty well done. At times it felt like I got a lot of clues, but couldn't piece them together. I also read this one very quickly and didn't take as much time to try and figure things out. I was surprised when I found out who the murderer was, but looking back I could see some clues pointing in that direction. Some of the clues seemed a bit far fetched though. But overall it was a fun mystery. I liked how much of the focus was on solving the mystery, although on the other hand I also would've liked to see a few more side plot lines. Yes I know I am contradicting myself. There were some nice twists and surprises in how the mystery progressed. One thing that bothered me a bit was how we didn't get to see one of the final clues. Julia reads something and thinks she figured it out, but we the reader don't get to know what she read or what she plans to capture the murderer. I am not a fan of that sort of scenes. I did like how in the end everything came to light and we got some more information about it all. I liked getting to know Julia and some of the other citizens in this small town. I would've liked to get to know Julia and some side characters a bit more in depth, but I think that will come eventually in the later books. We get a bit of a feel of some people who live here and I am looking forward to spending more time in this town. I liked the banter between Julia and detective Barker, it was a nice touch and I am thinking there might be a possible romance later on. There was enough description of the town for me to get a bit of a feel for how it looked and form an imagine in my head, although it didn't come as alive as I hoped. My first time reading Agatha Frost and I look forward to reading the rest of the series. A quaint cozy mystery that takes place in an English countryside town. Filled with twists and turns. A fast paced and enjoyable read. Agatha Frost is a lover of all things cozy. She is a crime fiction fanatic and enjoys nothing more than sinking her teeth into a good murder, with a cup of tea and a cat curled up on her knee. She lives in a quaint village in a sleepy corner of England, which provides more than ample inspiration for her Peridale Cafe Mystery series.